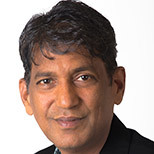 Prior to co-founding BlueData, Kumar was vice president of R&D at VMware where he was responsible for Storage and Availability in the Cloud Infrastructure Business Unit. Kumar’s responsibilities included VSAN, Virtual Volumes, Virtual Flash, Virtual Storage Appliance, SRM (Site Recovery Manager), High Availability, SMP-FT, and Virtual Storage Fabric. Before VMware, Kumar was the founding CEO and CTO of Agami Systems, a high-performance, distributed NAS company.